Scientists have genetically engineered a new protein called ArcLight to observe electrical activity in the neurons of the brain. The brain receives and transmits information by using electrical signals. These signals travel through synapses and neurons. By tracking neural activity in the body in real time, scientists get to understand how the brain works. There are different ways to monitor and observe brain activity such as MRI and fMRI which monitors the blood, water, and oxygen flow in the brain through magnets and radio waves. Another way is to use chemical calcium detectors that are fluorescent in nature. As signals travel through the neural network, the cells undergoes a shift in the concentration of its internal calcium ions. When this change in calcium ions is detected by the chemical, it reacts to it by glowing. With the development of ArcLight, scientists may be able to directly observe neural electrical activity in real time and even in parts of the brain that were previously inaccessible using other techniques. Scientists used fruit flies to show for the first time that a new class of genetically engineered proteins can be used to watch nerve cell electrical activity in live brains. The results, published in Cell, suggest these proteins may be a promising new tool for mapping brain cell activity in multiple animals and for studying how neurological disorders disrupt normal nerve cell signaling. Understanding brain cell activity is a high priority of the President's Brain Research through Advancing Innovative Neurotechnologies (BRAIN) Initiative. Brain cells use electricity to control thoughts, movements and senses. Ever since the late nineteenth century, when Dr. Luigi Galvani induced frog legs to move with electric shocks, scientists have been trying to watch nerve cell electricity to understand how it is involved in these actions. Usually they directly monitor electricity with cumbersome electrodes or toxic voltage-sensitive dyes, or indirectly with calcium detectors. This study, led by Michael Nitabach, Ph.D., J.D., and Vincent Pieribone, Ph.D., at the Yale School of Medicine, New Haven, CT, shows that a class of proteins, called genetically encoded fluorescent voltage indicators (GEVIs), may allow researchers to watch nerve cell electricity in a live animal. Dr. Pieribone and his colleagues developed ArcLight, the protein used in this study. 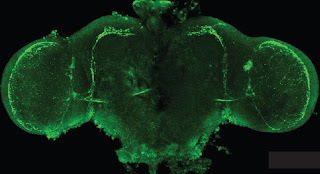 ArcLight fluoresces, or glows, as a nerve cell's voltage changes and enables researchers to watch, in real time, the cell's electrical activity. In this study, Dr. Nitabach and his colleagues engineered fruit flies to express ArcLight in brain cells that control the fly's sleeping cycle or sense of smell. Initial experiments in which the researchers simultaneously watched brain cell electricity with a microscope and recorded voltage with electrodes showed that ArcLight can accurately monitor electricity in a living brain. Further experiments showed that ArcLight illuminated electricity in parts of the brain that were previously inaccessible using other techniques. Finally, ArcLight allowed the researchers to watch brain cells spark and fire while the flies were awakening and smelling. These results suggest that in the future neuroscientists may be able to use ArcLight and similar GEVIs in a variety of ways to map brain cell circuit activity in normal and disease states.